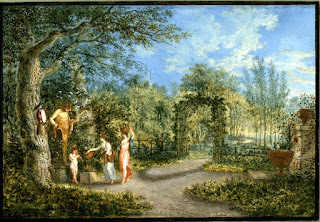 Waved o'er his cot, beneath the zephyr play’d. In autumn's richest vest of gold and green. 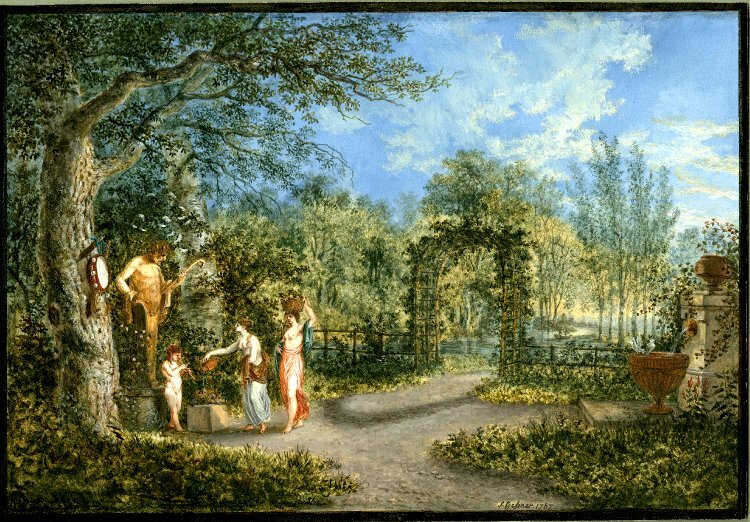 In their current exhibition, the British Museum curators have put Gessner's Pastoral Landscape on show next to a different memorial to Gessner, this one by Johann Heinrich Bleuler. 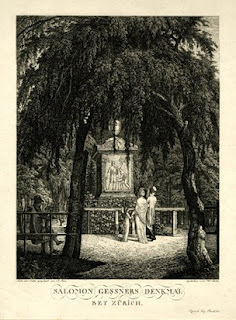 The etching was published in the year of Gessner's death and shows a memorial to him situated by a lake. 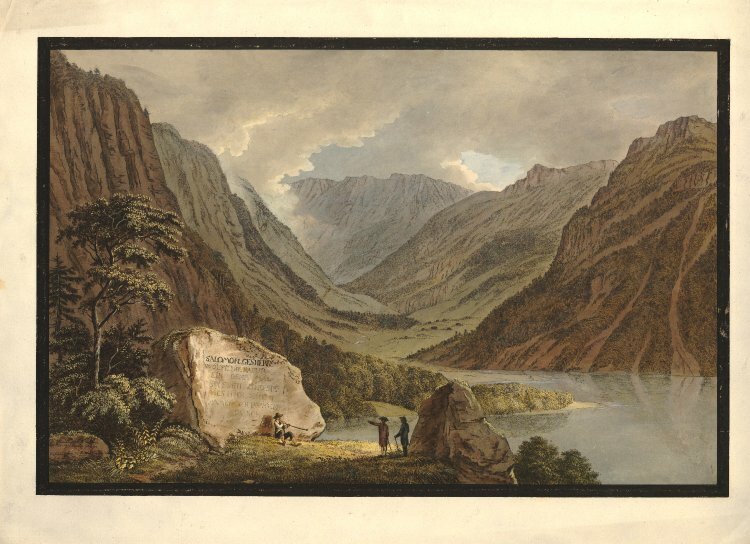 Was it imaginary, like Caspar David Friedrich's proposal for a monument to Goethe? If not, is there still something resembling this at Lake Klöntal, a permanent presence of a landscape painter in the landscape he painted? Yes, it would seem there is, according to the local tourism website and you can do a nice walk to it. They describe the origin of the inscription thus: 'Sie wurde ihm von zwei Verehrern gewidmet, die sich 1788 zur Einweihung des Gedenksteins mit Tränen in den Augen um den Hals fielen und küssten.' ('It was dedicated to him by two devotees who fell around the neck and kissed each other in 1788 with tears in their eyes for the inauguration of the memorial stone' - Google Translate). The writing looks quite amateurish and crudely done, but clearly those admirers meant well. Google is close (and gets closer all the time), but "Um den Hals fallen" = "embrace, clasp in one's arms" or (in more modern terms) "hug", although the addition of "tears" and "kissing" may even allude to the Prodigal Son (Luke 15:20, where the Prodigal's father "fell on his neck and kissed him", in German "Er fiel ihm um den Hals und küßte ihn") but I have no idea whether this would be appropriate in the context.